Posted on May 1, 2017 at 11:27 am. 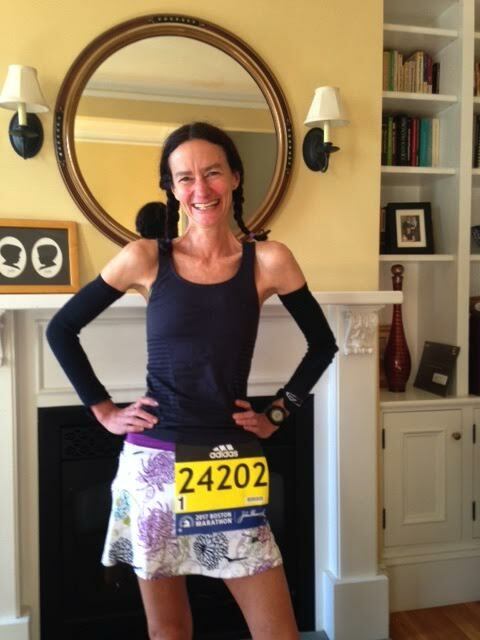 A couple of weeks ago I ran the Boston Marathon. I still can’t believe it. I really had no expectations going into this race. It had taken four tries to finally qualify for Boston and to be honest, I was just happy to qualify. I didn’t have a burning desire to run it. But once you tell other runners that you qualified, they all convince you that you have to run it. “It’s historic.” “It’s iconic.” “It’s BOSTON!! !” So I decided to put my name in the hat and since I qualified by 10 minutes, I was pretty much guaranteed an entry. My training was what you might call “very casual.” I started triathlon training in February so I had been adding 2-3 swims and a cycle session in addition to running to my weekly schedule. I also didn’t really have a time goal since I already qualified for Boston. I really just wanted to feel ready to run and to be able to just enjoy the experience. As you all know, winter training in Michigan is always challenging, but I made sure I got at least one or two 20-mile runs in before the marathon. I flew into Boston on Saturday (with the required delay in Chicago!) around 5 p.m. and took our first ever UBER (very cool!) from the airport to the condo we were staying at in Charlestown. My boyfriend/support crew Michael joined me on this journey, a non-runner (he even has the 0.0 sticker on his car to prove it). After arriving at the condo, I began researching dinner, of course! Having grown up on the east coast, I knew exactly what I wanted: a lobster roll! As much as I love living in Michigan, there is nothing like a New England lobster roll. As luck would have it, I found a place within walking distance of our condo that had lobster rolls on the menu. Score! We headed out to the Warren Tavern, which happens to be one of the most historic taverns in America. It is the oldest tavern in Massachusetts, erected in 1780. Lots of wood, low ceilings, dark, cozy and PACKED! We got a table right away and ordered a Sam Adams 26.2 beer, which was created especially for the marathon. Then I got my lobster roll. YUM! After a long day of travel we went back to the condo and crashed. 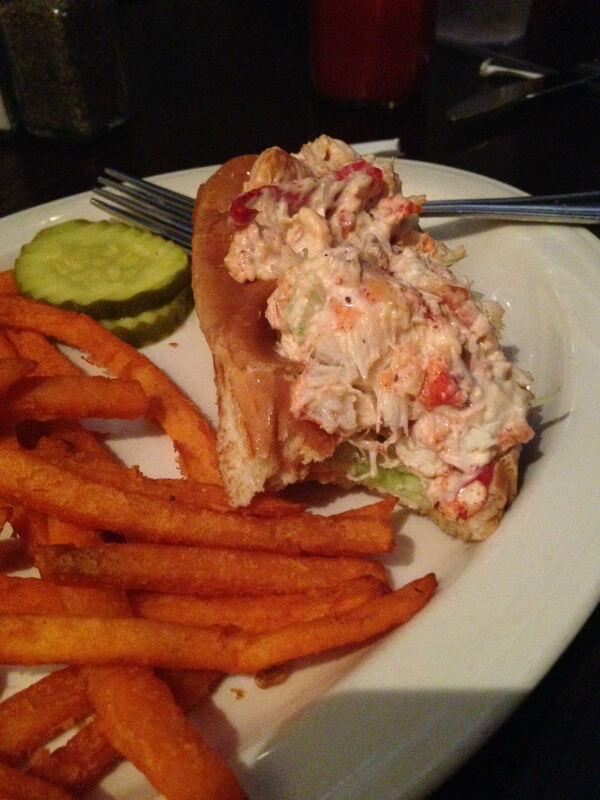 Lobster roll and beer… perfection! Sunday morning we got up, ate some breakfast and I had big plans for packet pick-up and the expo. It was a beautiful sunny day and VERY warm. I think it hit 80 pretty early in the day. What a smooth process. Picked up my number, my t-shirt and a swag bag of goodies. Then went to check out the expo. Holy cow! It was like runner heaven … shoes, compression gear, watches, nutrition, jewelry, recovery gadgets, you name it. I walked around, ate a few sample energy bars, but I am not much of shopper so no purchases for me. It was time to get some carbs in my belly, so I found a market that made these yummy-looking flatbreads. (Later in the day this would be not a good choice…) I sat down outside the convention center and ate my snack while watching Ultra runner Scott Jurek at the CLIF pop-up store signing books and posters. I went to get in line after finishing my snack but they had stopped the line. Oh, well! It was around 2 p.m. by now and I had plans for 3 p.m., so I decided to take a walk down Boylston and check out the finish line. The whole street was lined with barricades and it was pretty unbelievable to see the huge banner crossing the road, the bleachers, all the things I have been seeing on TV watching the marathon for years. It was kind of surreal that tomorrow I would be running this stretch of road. I took a good mental snapshot of the area and would use that image to motivate me on Monday when things got tough (which they definitely would). After that, I found a bagel store to pick up bagels for my morning breakfast, then headed back toward the convention center for my 3 p.m. date. 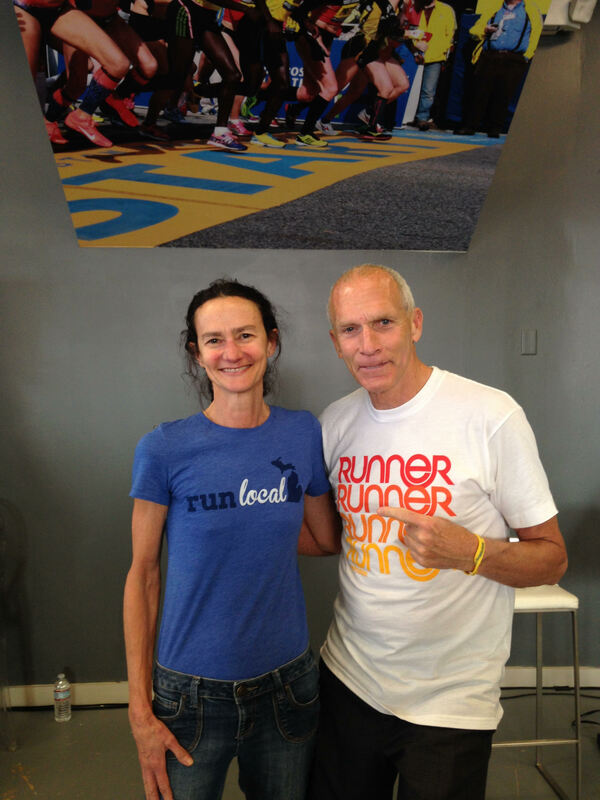 Across the street was the Runners World pop-up shop and I was so excited to hear Bart Yasso speak (#runnercrush). For those who might not know Bart, his title is Chief Running Officer at Runner’s World, and is sometimes called the Mayor of Running. He has run more than 1,000 races, everything from marathons to 5Ks to Ironman to ultramarathons. His book My Life on the Run tells his amazing running journey and is so inspirational. Most famously he is known for inventing Yasso 800s, a.k.a. the workout that runners love to hate. He gave a great talk, telling inspiring, funny stories and answering any questions folks had. After the talk, I just knew I needed to ask for a picture. So I went up and he was so kind and said absolutely! After the talk, my stomach began talking to me and it wasn’t happy talk. We headed back on the T (subway), which was INSANELY crowded. Literally jammed in like a can of sardines. Back at home my belly was still not behaving but I decided I needed to try and give it some food. After all, I had 26.2 miles to run the next day. I made my traditional pre-run dinner of mashed potatoes (lots of salt and a little butter). Usually I add a fried egg but I was taking it easy on my belly. I ate the potatoes and immediately knew that they were not happy in there. Sparing the details, I spent the night up and down, sleeping for maybe an hour. Not ideal. Got to Boston Common and it was a sea of people and school busses. 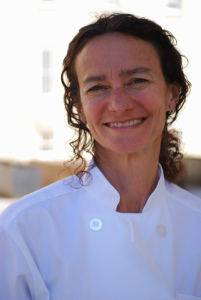 I got in line for the bus and was feeling tired, thirsty and hungry but my belly felt okay. I had forgotten to bring a bottle of water for the bus … hydration fail. 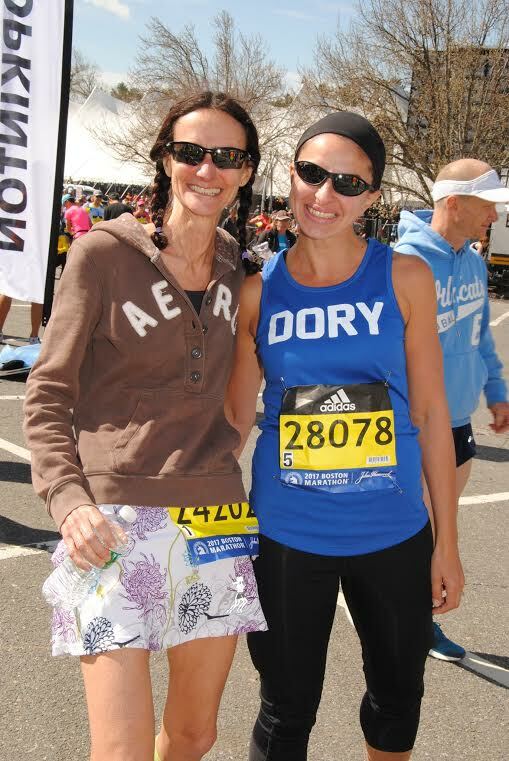 I started chatting with the woman (Dory) waiting in line with me. Me: Have you run Boston before? Her: No. Actually I have never run a marathon before. Her: Actually I ran a 5K in Boston and won the raffle which was a FREE entry to the Boston Marathon. Me: WHAT???? That is so cool! The bus dropped us off at the Athletes’ Village and it truly was a village. I don’t run with my phone, but here is where I wished I had been able to take a photo. The tiny town of Hopkinton was taken over by runners, busses, volunteers. There was a giant tent on a huge field with a sea of port-o-potties, tables filled with bagels, bananas, coffee, water. Everything a runner needs. At this point I decided I needed to try and eat SOMETHING. I nibbled on a banana and managed to finish it and feel okay. Dory and I had about an hour to wait before our wave started. There are four waves and eight corrals in each wave. The elites take off at 9:30 a.m. (women) and 10 a.m. (men) and then each wave follows. We were scheduled to take off at 11:15 a.m. Around 10:45 a.m., we actually started walking to the start line and the parted ways. She was corral 8, I was corral 1. You walk down a small neighborhood street lined with typical New England farmhouses and EVERYONE is lining the street. One group of young girls had a table set up with sharpies and were offering to write your name on your arm, your bib, wherever. I am soooo glad I took advantage of this “perk” as it would come in really useful later. We walked another half mile or so and then made a right turn toward the famous Hopkinton start line. They funneled us into our corrals. Everything was so smooth and organized. Amazing with 30,000 runners. Then all of a sudden I crossed the start line of the Boston Marathon! I got a little teary (the first of many times throughout the day) as I cruised down the first hill (keeping my pace conservative, as I had been warned about the downhill). I started to remember all the attempts it took me to get here, especially last year’s Bayshore attempt where I missed it by 2 SECONDS. I felt so grateful to be here running, seriously under-fueled, but not thinking about that. 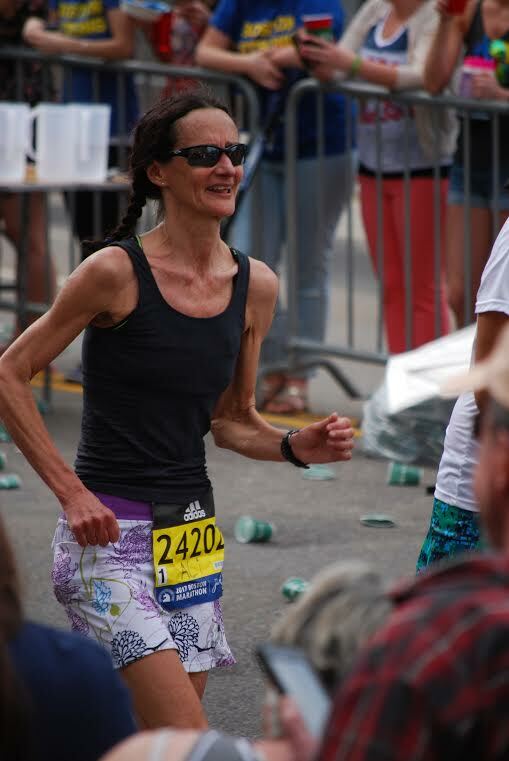 If there is one thing I have learned in my years of running, it is that running is much more mental than physical and I was just going to focus on the positive, and smile and breathe. The first few (downhill) miles went by in a blur. I was feeling tired, but kept smiling. The crowds were lining every street and my adrenaline started to kick in. I decided after a few miles to try and eat half of a Clif BLOK. There were water stations every mile, which was a good thing as the temperatures were really starting to climb. It was easily in the 70s by now and I was making sure to drink at each station, since I started the race not hydrated at all. There was so much to look at and take in, from the towns to the other runners. I saw blind runners running alongside guide runners, runners with a special bib on their back that said 80+ runner, a runner on crutches (he actually had a Wave 1 bib, so my guess was that he qualified with a fast time and then got injured, but decided to “run” anyway … wow!) There were police, fireman and military everywhere. Around Mile 6 we ran through the town of Framingham, spectators lining both sides of the street. I look to my left and who do I see but my #runnercrush Bart Yasso! I run toward him and he gives me a big high five. Well, that high five powered me through for another mile or three. I decided I would try the other half of the Clif BLOK. After Framingham there was a nice quiet stretch of road with no spectators and a lovely lake. But soon enough we were in Natick (around mile 10), another picturesque New England town, the streets lined with people. I was feeling okay at this point, just a little tired. Then suddenly we are at the half marathon point and Wellesley College. I had heard that the screams from women of Wellesley could be heard before you even get there. Well, they weren’t kidding! Here is where I started to hear “Go Ali!” “You look great” You look strong” and would continue to hear those chants for the rest of the race! What an incredible boost! We are around Mile 15 now and I look to my right and who is running right alongside me? Ultra runner Scott Jurek!! Besides being an awesome ultra runner, completing numerous 100 mile races, he recently completed a through-hike of the Appalachian Trail (2,100 miles) in a little over 46 days (breaking the previous record.) I cruised over and casually struck up a conversation. He was super nice and even was kind enough to say I looked great, strong … And then all of a sudden as we headed through the town there was a television camera above the road with a big sign that said SMILE for the camera. And there I was running alongside Scott Jurek!!! Okay, so that high kept me going for a while. I popped another half of a Clif BLOK and got ready to tackle the Hills of Newton. 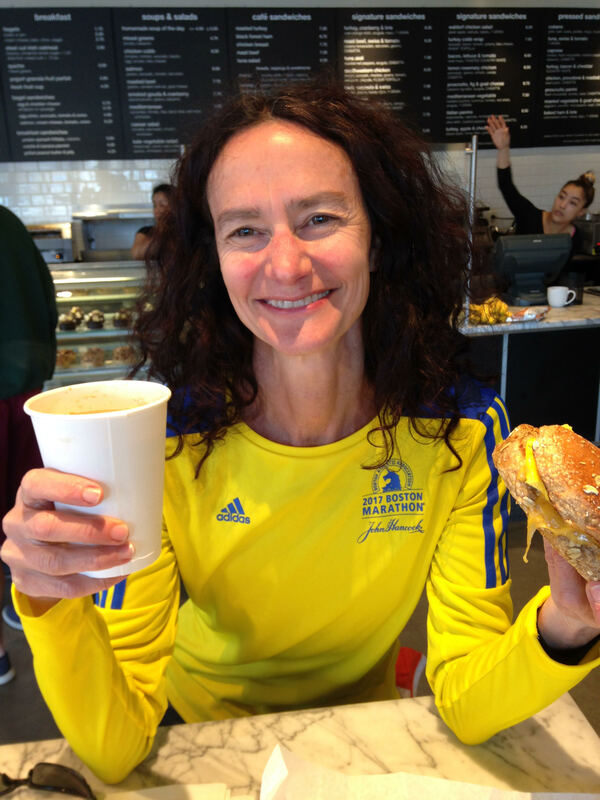 Everyone hears about Heartbreak Hill (for good reason) but the Hills of Newton are no joke! Three fairly good-sized hills one after another. Whew! The crowds really were helping at this point. Also, the heat was definitely building and in addition to drinking at each aid station, I was pouring one cup of water over my head. Some spectators even had coolers of ice, wet towels, oranges, ice pops. I “may have” put a few ice cubes down my sports bra … just sayin. The Hills of Newton end and then we are at Mile 20 and the famous Heartbreak Hill. Mile 20 is traditionally where they say the race really starts. So naturally you want to put a mile long hill on the course for the runners. I looked ahead and dug deep, and thought to myself “I could really use a high five from Bart about now.” Wouldn’t you know it, I look to my left and there he is. I kid you not! Not only does he high five me but he says “you again, looking strong!” Well, to say that helped me get up Heartbreak Hill is a serious understatement. The hill was no joke but once I crested the top, my smile, which had not quit for 21 miles, turned to tears—happy tears. But there were still 5 miles to go. Looking focused at Mile 24/25. 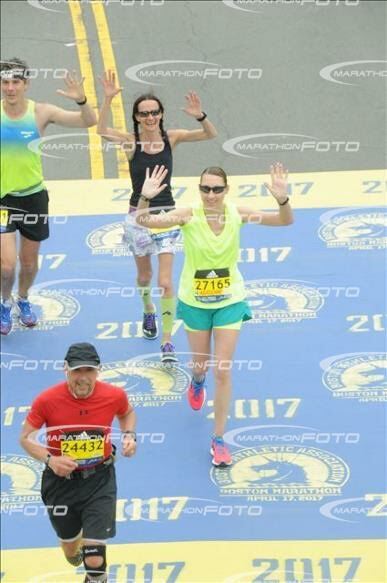 I saw the big giant Citgo sign and then we made the right on Hereford Street and the left on Boylston Street and I knew that it was only a few hundred yards at this point and I would be a Boston Marathon Finisher. My smile was starting to hurt more than my legs at this point. I was approaching the finish line and then I heard it — “Ali Lopez” — and I crossed that line, tears flowing and feeling slightly amazed that I had really done it. Once you cross the line, it is so organized. They put a medal on you, you walk some more. They give you a bottle of water, you walk some more. They give you a heat blanket, you walk some more. And then they give you a bag of food. No thinking was involved at this point. I headed to the family meeting area, borrowed someone’s phone and waited for my boyfriend to find me. I was a little dizzy and nauseous at this point but managed to get a banana down. Yay, potassium! We headed back to our condo on the T —you are truly treated like a celebrity in Boston. You ride for free, everyone says congratulations, three people offered to give up their seats for me (I finally accepted the last one)! I still was not feeling hungry, but knew I needed something else. I went for a protein chocolate milk. After a very long, delightful shower I was suddenly hungry, like very hungry, like ran-a-marathon-on-a-banana-and-four-Clif-BLOKs hungry. As luck would have it, we found a great place that was within walking distance. 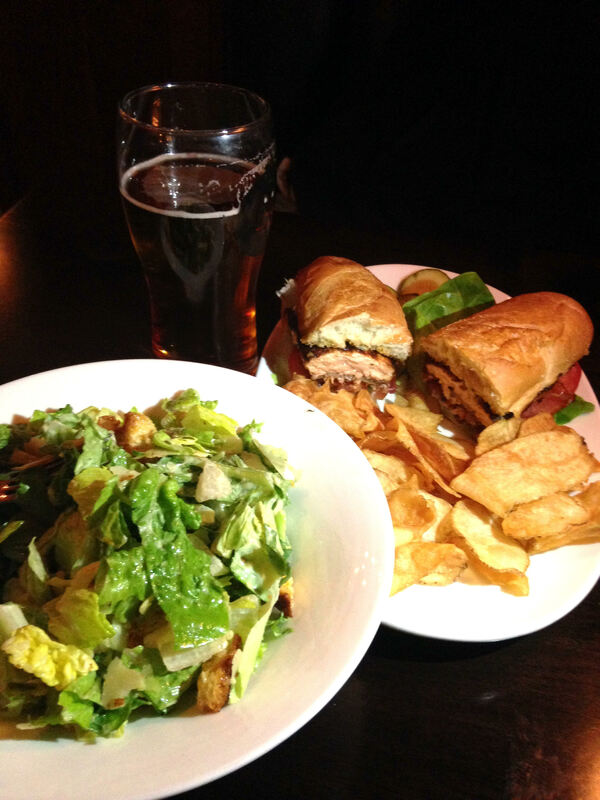 I devoured a Salmon BLT, homemade potato chips and a big Caesar salad and drank a delicious beer! Back home I crashed pretty hard and slept through the night! Tuesday morning I got up and immediately ate a bowl of cereal and then was ready for more breakfast. Our flight wasn’t until the afternoon so I put on my Boston Marathon Shirt (and medal, of course) and we headed out for some more food. Coffee and a bagel egg sandwich FTW. Now that I have been home for a week, have refueled and come down off my runner’s high, I have had a chance to really reflect on the experience and realize how amazing it truly was. 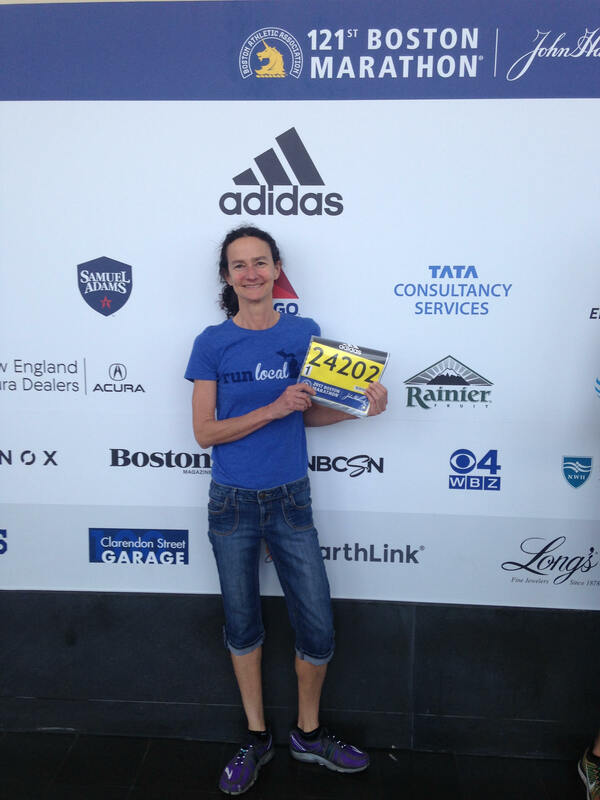 The city of Boston really cherishes this race and as a runner you feel so supported and cared for. The volunteers were particularly awesome. Encouraging you and always with a smile. (I read that there were 9,400 of them!) Even though I would have liked to have run the race properly fueled, I can’t imagine that my experience would have been any more amazing. (Although maybe my time would have been better ☺) The Boston Marathon truly is a one of a kind race that really does live up to hype. 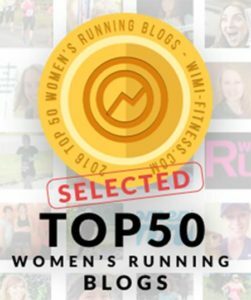 Thank you to all my runner friends for encouraging me to go for it! And if you have made it through this race report … congratulations to you as well. Quite the marathon!